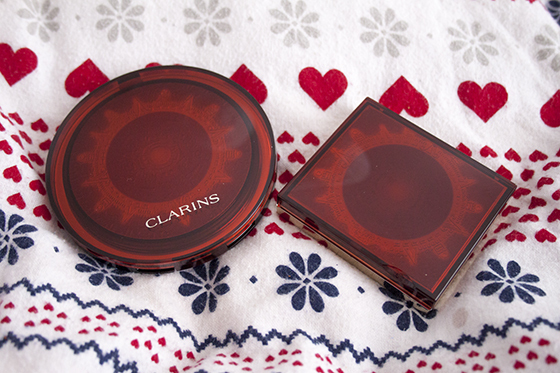 My love of Clarins limited editions has been documented before on this blog in the form of their Odyssey limited edition collection. It's few and far between that brands really impress me to the point I feel I have to blog about something as soon as the items in my hands! As per usual as soon as I got my grubby paws on these last night I wanted to post about them. That's how excited a few bits of makeup made me! Sad right? 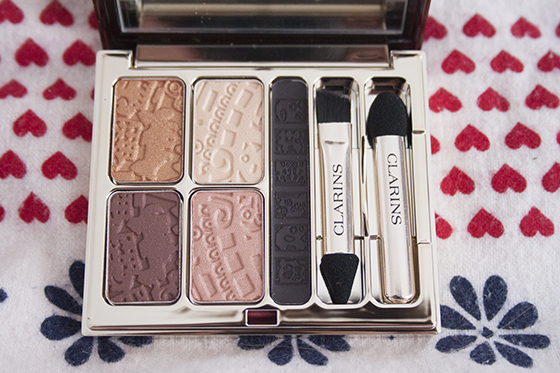 Clarins Limited Edition face and eye palettes for summer 2013 have been inspired by the accent ruins of South America, a region driven by colour and print. Splendours is inspired by the embellishments, glittering bronzes, golds and splashed of exotic rubies, jades and sapphires. 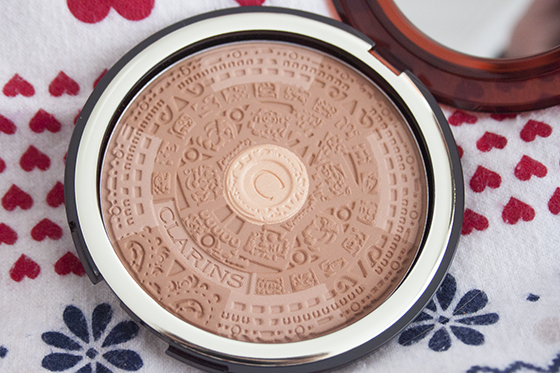 The Clarins Splendours Summer Bronzing Compact is a beautiful warm toned, bronze and terracotta bronzer. It's rich in mineral pigments and gives the face a flawless and sun kissed glow, it contains a "Light Optimising+ Complex" which visibly enhances and smoothes the skin. It feels really soft and buttery and gives a really lovely warmth to the face with minimal effort. I had this used on me at the blogging event and it really added lots subtle warmth to my face that complimented my skin tone. As I'm fairly pale (well as pale as I get!) at the moment but it looked subtle and natural and not too muddy which is normally my biggest gripe with bronzers. I cant wait to use it once the sun hits my skin as once I'm tanned as it will be perfect. The larger size means you can either use it as a all over glow with a large kabuki brush or be more precise with a smaller brush to contour and bronze. It's fairly matte but it does contain a slight shimmer in the centre of the compact which can be easily avoided. This might be slightly too orange toned for some but it's something worth swatching if you see it on the counter. I absolutely love the packaging and the print too, it's almost too nice to use! 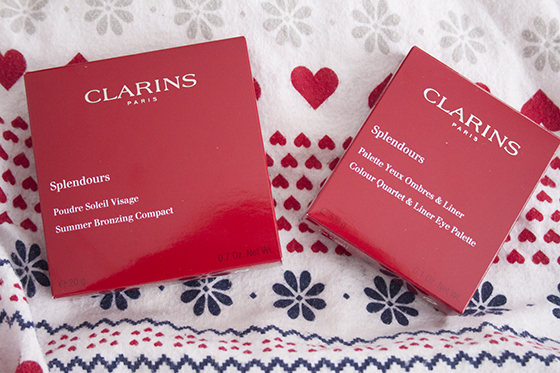 The Clarins Splendours Colour Quartet and Eyeliner Palette is another limited edition item coming Summer 2013 which as soon as I saw I did a little gasp. 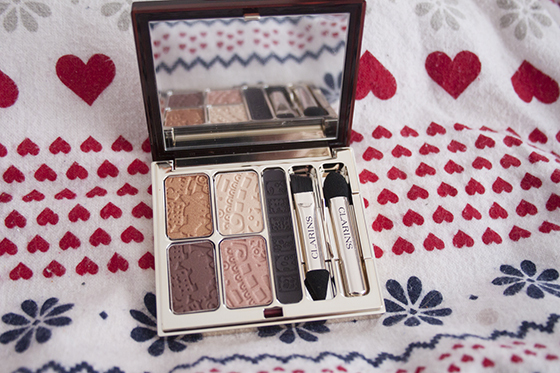 How beautiful are the shades! I can imagine myself using this religiously from now on as the colours are just so me. The shades included in the Limited Edition Eye Palette are exquisite shimmery shades including a copper, pale gold, a rose gold and a deep plum. I originally didn't event notice the darker plummy black liner shade as I was so bowled over with the four other shades but it's the perfect shade to compliment the softer tones and define the eyes. 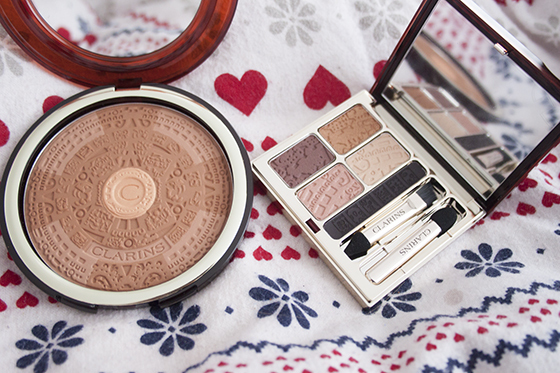 All the shades are rich, warm, shimmery and the perfect quartet for summer. All presented in the classic Clarins packaging and embossed with the collections theme. I think this is absolutely stunning and I cant wait to give it a proper go! 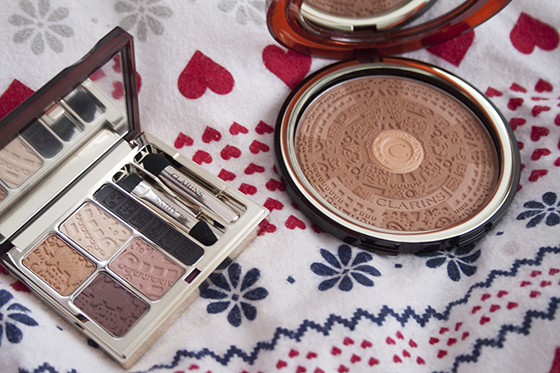 This collection launches around April 2013 and is priced at £30 for the Summer Bronzing Compact and £31 for the Eye Quartet. Personally I think the eye palette price is totally justified, it's absolutely stunning and definitely a splurge item that you won't regret buying as it's incredibly usable. The Splendours Bronzing Compact is slightly pricey, but it's very luxurious and if you're in to your pretty packaging and limited edition items it might be worth splashing out on. My hero from this collection is definitely the Eye Quartet though, and I cant recommend it enough, definitely one to check it out once it hits counter!